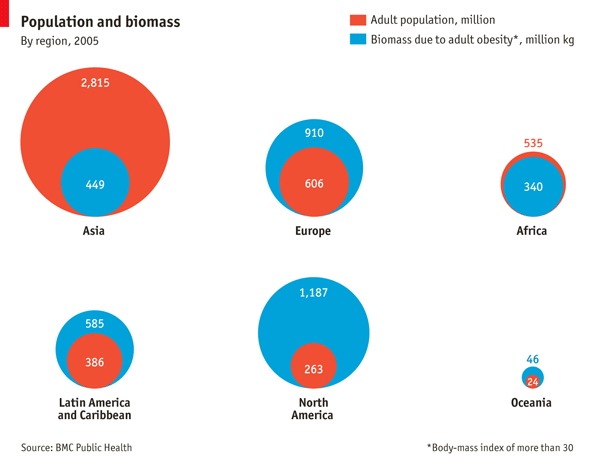 This graphic from the Economist shows the amount of excess biomass due to obesity and overall population. As the chart shows, obese North Americans are carrying around an extra 263 million kilograms of fat — or just about 290 thousand tons of fat. That’s a daunting thought. If the populations of other countries adopted the pattern of weight distribution found in the United States, the world’s [human] biomass would rise by 20%—roughly equivalent to adding an extra 1 billion average-sized people. This would create all kinds of strains, not least on the world’s food supply. Or perhaps more relevantly for this blog, the environmental impact would also be dire, given the amount of land, water, fertilizer, and pesticides that would be needed to produce that amount of food. Even without regulatory interventions, there may be a limit to how much food the world can grow, making all due allowances for technological improvements (and disregarding use of crop lands for other purposes such as growing tobacco or biofuels.) Economic growth may increase demand, especially for previously hard to obtain foods like meat, faster than supply can rise. If so, that would limit some of the harmful health and environmental harms from over-eating — but it would also impose great hardship on the world’s poor. The obesity epidemic is already a major public health problem in the U.S. We need to get it under control, and we need to avoid replicating it elsewhere. I wholheartedly agree, but I don’t know how we can do this. Unfortunately, people in this country have the freedom to stuff their mouths endlessly with all sorts of high-calorie food, and I imagine people would rise up everywhere against any move to restrict that. I have a unique perspective, because I spent last year taking off 50 pounds. I did it the “old-fashioned” way – I just kept the food out of my mouth. It meant saying ‘no’ to myself A LOT – because high-calorie food is cheap and available everywhere – so I learned to walk by food stands and kiosks (even if it did smell so very good). I skipped the french fries, chips and bread baskets. Just about every meal served at a restaurant is too much – I learned to push away food on the plate, requiring myself to leave part of it behind, or better yet, just not eat out at all. It wasn’t easy – no, not at all, but what kept me going was my determination to get the weight off. But, sadly, this is what is lacking with most people. They are unable to tell themselves “no”. I don’t believe people when they tell me that they’ve tried “everything, but nothing works”. Dieting is hard work, and it involves being hungry, which is physically uncomfortable. But it’s also survivable, but it seems that a lot of people can’t push themselves through that. I should mention that I previously took off the same amount of weight, but gained it all back over about three years. I gave it some thought and realized that it was because I hadn’t changed my eating habits, so this time, I dieted while also planning how I would eat once I wasn’t dieting anymore. Strangely enough, my post-diet diet does not look that radically different from what I ate while I was dieting. I get a lot of complements these days, as you might imagine. One friend complemented me, and then told me she’s getting bariatric surgery at the end of the month. Another friend complemented me, and then told me she’s getting liposuction in a few weeks. The studies confirm that it’s very hard for people to lose weight and even harder for them to keep it off. That’s why it’s important to try to keep them from gaining weight in the first place. But there are a number of intervention that may help with that, particularly among children. Oh I certainly agree that it isn’t easy, and if you do it right, it takes a lot of time, too. When my older son was in first grade, as a treat, I gave him money to buy lunch at school. He came home and I asked him what he had for lunch. “Pizza, french fries, and chocolate milk!” I rarely bought my kids lunches at school after that. Physical inactivity plays a BIG role, too. Too much electronics, not enough exercise. I would agree that not gaining weight in the first place would be helpful, but for those who are overweight, all is not lost. Excercise is the key, not diet. I believe you can eat as many calories as you like providing you’re doing enough activity to burn them off. Is Duke Energy Playing the Regulation Game?